HDTV Supplys 4K 8X8 HDMI Matrix Switch over HDBaseT is the most innovated 8x8 HDMI matrix in the world. It has 8 standard HDMI inputs and 8 UTP type HDMI HDBaseT outputs. Because it is a matrix switcher, it allows any input to be routed to any output; or the same input to be routed to all outputs, or any combination. The 8X8 HDMI Matrix Switch over CAT5 cabling is fully 4K HDMI V1.4 supported. Advanced EDID management, IR functions, memory management and internal power supply are just a few of the features that make this series stand out. 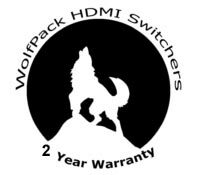 The base model of this WolfPack WolfPack 4K 8x8 HDMI Matrix Switcher Over HDBaseT is HDTV Supplys WolfPack Modular Matrix Switcher. A chassis that has room for 1-8 port HDMI input card and 1-HDBaseT RJ45 output card. Why not buy this 8x8 HDMI Matrix Switcher Over HDBaseT today?